A guide for those who wish to launch their own business ISBN: 978-1-908272-39-3 Published by Academic Publishing International. Small Business: Journey to Success highlights the issues required to be mastered for the success of a small business over the short term, medium term and the long term. The ideas and concepts required are fully discussed and are supported by many interesting and relevant examples. Small business success is a journey. Like all journeys it is important to know where to start and how to progress towards the final destination which in this case is creating and keeping a successful small business. This book has been written for a number of audiences. It provides a guide to those who wish to launch a small business and it will also prove invaluable for those already on their way to business success. Additionally the book is suitable for students and faculty who are more interested in small business success from a study and research point of view. 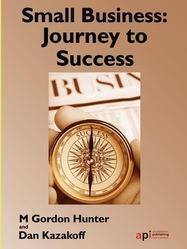 This book provides a solid text to build either an undergraduate or a post graduate course on small business success. 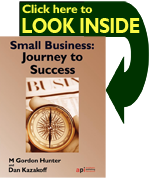 Whatever your focus Small Business: Journey to Success provides an insight into all the important issues relevant to small business success.